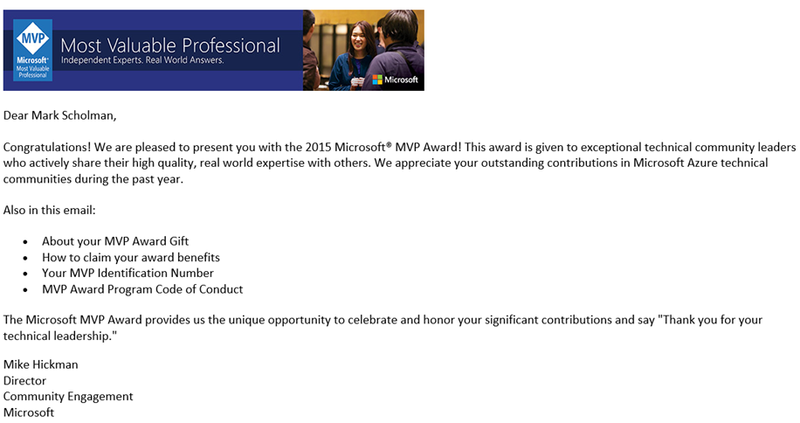 Last week I have been awarded with the Microsoft MVP Award. So what is an MVP award? Technical communities play a vital role in the adoption and advancement of technology—and in helping our customers do great things with our products and services. For more than two decades, the Microsoft MVP Award has provided us an opportunity to say thank you to independent community leaders and to bring the voice of community into our technology roadmap through direct relationships with Microsoft product teams and events such as the MVP Global Summit. I feel really honored that I am part of this great community. I have met and talked to a lot of great people last year and want to thank them for their support. Also people reading my blogs / forums, following me on Twitter. Thank you very much for interacting with me and looking forward to continue with that.